I lived with my wife Janet and two children, Khamisah and Luke, in the bottom flat of a villa owned by a local Qadhi, an Islamic judge, and a very cheerful fellow who lived above us with his wife and four young daughters. It was located in what was in those days referred to as Somali town – a neighborhood halfway between the main North-South boulevard and the coast road. Like every other residence on the street it was surrounded by a ten-foot wall, so when I stepped out the front gate that morning at 5 o’clock there was nothing but a dark, empty road, tall blank walls on both sides, and the vaporous humidity that hung like fog. I was waiting for a taxi to take me to the airport for an early flight to Riyadh. And then I waited some more. Finally in the distance I saw a tell-tale yellow Datsun cab coming my way. Apparently it had some alignment problem as it looked like a crab with the front wheels about a foot to the left of the rear wheels, but it came rolling on. As it got closer, it slowed down and I could see that the left headlight was never going to shine again and the fender had been modified with a ball peen hammer. I heard the radio blaring as the cab approached and as it slowed almost to a halt I was able to see the driver. An ancient, wrinkled Bedouin with a long gray beard he looked like the grandfather of some Biblical patriarch. He eyed me with nothing but suspicion, decided that I was some sort of demon from the inner reaches of hell and sped up. About fifty feet later he stopped. Even a demon could be a paying customer. The old man took a second to compose himself and then slowly turned around, glared at me through rheumy eyes and said in angry Arabic. “Jimmee Jones! What in the Hell is this Jimmee Jones?” I took me a few seconds to figure out what he was saying because Jimmy Jones was the last name I ever expected to hear from this wizened Jeremiah. The night before there had been reports about Jonestown on the BBC but the tragic conclusion still wasn’t fully known. It was now. The old man stared at me with implacable eyes. He wanted an answer. My Arabic has never been close to fluent but during those years in Jeddah it was barely passable. I gave it my best shot and said, “Jimmy Jones. Jimmy Jones is majnoon, crazy.” He replied, “Majnoon?” “Yes. Majnoon. There was a shaitan , devil, in his heart, galb.” “A shaitan in his heart?” He blinked at me. “Majnoon?” I nodded solemnly. He considered this and then said, “Khalas, finished. Jimmee Jones majnoon.” As if to say that all Americans weren’t insane, it was only Jimmy Jones who was nuts. He gave me a wide grin that showed all five of his remaining teeth, turned around and started up the cab. His name was Abu Hamid. 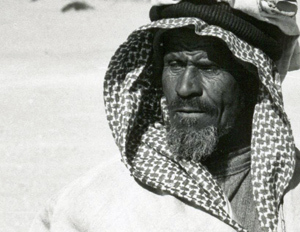 Even compensating for the wear and tear of Bedouin life, Abu Hamid was fairly old, maybe 70, and had happily spent his entire life in the desert north of Jeddah. His son Hamid had died as a young boy, he had three daughters and many camels. His wife had fallen ill and needed to be treated every week at the hospital, so he had moved to Jeddah and was getting by by driving a taxi. He really didn’t like the city. Pointing at the trash along the road he said, “The city is dirty. In the desert, every wind makes it clean again.” He couldn’t wait to return to his camels. He asked if I had a son. When I said I had a son and a daughter, he said “Congratulations! Two.” And then added that I should get with the program and have at least four more sons. We had a fine ride. He dropped me at the airport and I watched as he crabbed his cab past a double-parked Mercedes limousine to drive away. I could well have been the only American he had ever talked to, so he was right to be wary of picking up Jimmy Jones II as cab fare. However, like a true Bedouin he was insatiably curious and felt it his right to stop and ask me point blank about Jonestown. I’m sure that in his many years in the desert he had met his share of mentally disturbed people. Maybe even witnessed the devil jumping into the heart of someone he knew closely. When his glacial expression turned into a near-toothless grin we were no longer a young American and an ancient Saudi, we were two guys going to the airport. Flying to Riyadh, looking down at the desert that might have been part of his range, I kept thinking about Abu Hamid. Born around 1910, in his lifetime he would witness the end of generations of tribal conflicts swept away by the rising power of King Abdulaziz ibn Saud and then the beginning of the end of his entire way of life when the first pickup trucks appeared in the desert. Now he was driving around Jeddah in a beat-up taxi, listening to the radio news, apparently intrigued about the news of Americans and their inexplicable behavior. Watching the desert unfold beneath me, its surface marked by alluvial fans and river beds that once ran wild and free five thousand years ago now dried up like the wrinkles on the old man’s face, I realized that Abu Hamid was more sophisticated than the average American. Bitter civil wars and terrible massacres in Africa, devastating famines in Bangladesh, horrendous ferry boat disasters in Indonesia, earthquakes in Italy or bloody coups in Chile barely entered the American consciousness. A few years later 7,000 Indians would be killed in one night by the negligent operation of a Union Carbide pesticide manufacturing plant in Bhopal and it barely registered on an American public immersed in wondering, "Who shot JR?" During the student demonstrations of the sixties, the protestors would chant, “The whole world is watching.” And it was. Unfortunately, neither then or now, do many Americans seem to be watching the world as closely as Abu Hamid is watching them. Read more by Tim Barger.